In a tense showdown at Sabarimala in Kerala, about 200 frenzied devotees Tuesday tried to prevent a woman pilgrim from entering the hilltop shrine suspecting her to be of menstrual age and allegedly attacked a cameraman of a Malayalam television news channel. Ignoring prohibitory orders, devotees and right wing activists gathered in huge numbers at Sannidhanam, the shrine complex, following which a senior state RSS leader addressed them using a microphone to bring the situation under control. Though a rush of pilgrims is hardly witnessed during the annual "Sree Chitira Atta Thirunal", the hill temple saw an unprecedented flow of devotees this time when it was opened for the two-day special puja Monday evening. Clapping and chanting 'Ayyappa saranam', a huge crowd of devotees surrounded Lalitha Ravi (52), suspecting her to be of menstrual age, but police intervened and escorted her out. The woman showed her Aadhaar card to them to prove she did not belong to the "traditionally barred" age group of 10-50 years though the Supreme Court has allowed entry of girls and women of all age groups. Police later escorted her to the shrine to offer prayers along with her other women relatives. Hailing from Thrissur, Lalitha came to the hill temple, which opened this morning, with 19 relatives, including women, for her grandson's 'chorunnu' (rice giving ceremony). Police at sannidhanam said a case has been registered against 200 "identifiable" persons in connection with the incident, based on her complaint. When the situation went out of control, senior RSS leader Valsan Thillankeri, who has been camping at the shrine complex since Monday, pacified the angry agitators and asked them to maintain calm and cautioned against alleged "unruly elements", who could intrude to create trouble at the hill shrine. "The leadership has the responsibility to avoid any kind of untoward incident. That's why I addressed the devotees. It was to help the police," he later told reporters. Valsan also courted a controversy for allegedly violating the key tradition of the Sabarimala shrine by climbing the sacred 18 steps without carrying the customary 'irumudikkettu' (sacred offerings to Lord Ayyappa) on his head. TV channels aired visuals of the Sangh leader standing on the golden steps, leading to the sanctum sanctorum. However, he rejected the charge and said he did carry the offerings while climbing the holy steps. Scores of devotees shouted at Vishnu, the cameraman of a Malayalam TV news channel, as he was taking visuals of their protests. TV channels also aired visuals of some protesters hurling a plastic stool at the cameraman, who climbed up the sun-shade of a building to capture the protest. The news channel also alleged that the agitators threw a coconut at him, which devotees offer to the deity. Vishnu was seen handing over his camera safely to other journalists standing below the sunshade. The police said no case has been registered so far in connection with the incident. Girls below 10 years of age and women above 50 have frequently prayed at the Sabarimala Lord Ayyappa temple in the past. However, the entry of women of all ages has become a sensitive issue after the September 28 Supreme Court verdict. A group of young women from Andhra Pradesh had to return from the base camp, Pamba, following protest this morning. Another batch of women from the state, aged above 50, were prevented by devotees at 'nadappandal', the area near sacred 18 steps, as they did not carry the 'irumudikettu'. But police later escorted the aged women to the shrine complex after convincing devotees. Chief Minister Pinarayi Vijayan said "certain people" were trying to destroy the peaceful atmosphere in Sabarimala. "They are trying to prevent devotees arriving there for darshan. Real devotees and society will identify such forces," he told reporters in Kozhikode when his reaction was sought about the developments in Sabarimala. A 30-year-old woman, who had reached the base camp at Pamba with her husband and two children on Monday, went back early this morning without offering prayers. She had told police that it was her husband who was keen that she should worship at the Ayyappa temple. 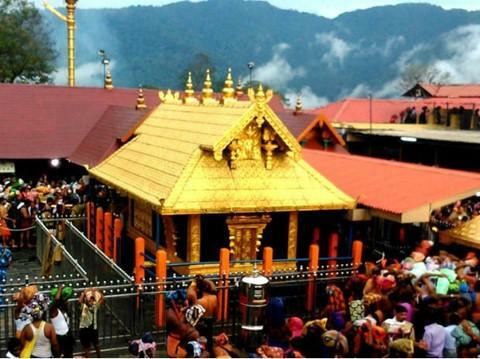 Several journalists had been attacked by devotees when the doors of the Sabarimala temple were opened for six days on October 17 for the first time since the Supreme Court allowed the entry of women of all age groups into the hill temple. Attempts by around a dozen women, including activists and journalists in the 10-50 years age group, to script history came to nought as frenzied devotees of Lord Ayyappa heckled and hassled them and forced them to retreat. The Ayyappa temple opened Monday for the second time in three weeks for a two-day special puja amid unprecedented security over apprehension of protests by those opposing the Supreme Court order, allowing women of menstrual age there. Hundreds of police personnel, including armed commandos, are keeping a tight vigil in the temple complex and nearby areas to prevent any untoward incident.